Flavor Text: Unable to grasp the infinite, he started to gibber and drool. What does this card do? I mean, what happens when i choose a character that cant go insane? How about not having enough cards? I'm completely confused by those chose only legal targets but sometimes do as much as possible semantics. Character controller chooses to make the targeted character to go insane or discard cards. If character can't go insane he must choose the discard cards option. Players has to fulfill the effect as much as possible so he will discard all cards if X is higher than his hand. Yes, it is a good card. Are you seriously considering not playing with any characters skill 2+ that cant go insane against hastur? 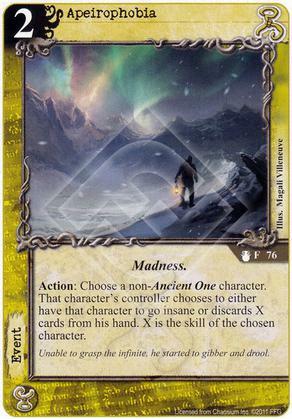 Q: If the target character cannot go insane, and the character's control cannot discard the exact number of cards equal to the chosen character's skill, what happens? A: You discard up to X. All cards are drawn and discarded individually and when you are directed to draw or discard a number you do so one at a time until the number is reached or you are no longer able to draw/discard. Up to is a qualifier that lets a person choose any number up to the given number. IF it was included in this effect the controller of the character could choose to discard 0 cards since up to is the upper limit but has no minimum number. The only way that drawing or discarding a number of cards fails because you do not have the stated number is when that effect directs you to choose that number of cards. Since you must choose that number and are unable to do so what you do with those cards is ignored since you failed to choose them.